I've been smitten with this pattern forever. I mean, not in PINK, but still. Scrumptious. And then I spotted it on a wall and my heart skipped a beat. photo via Smarty Pants Paper Co. I've discovered that there is a weird side effect of having a "non-creative" job during the day. Sometimes late at night, when you have an idea, you have to find a paintbrush that very instant and obey the voices. Surely there's a word for that? 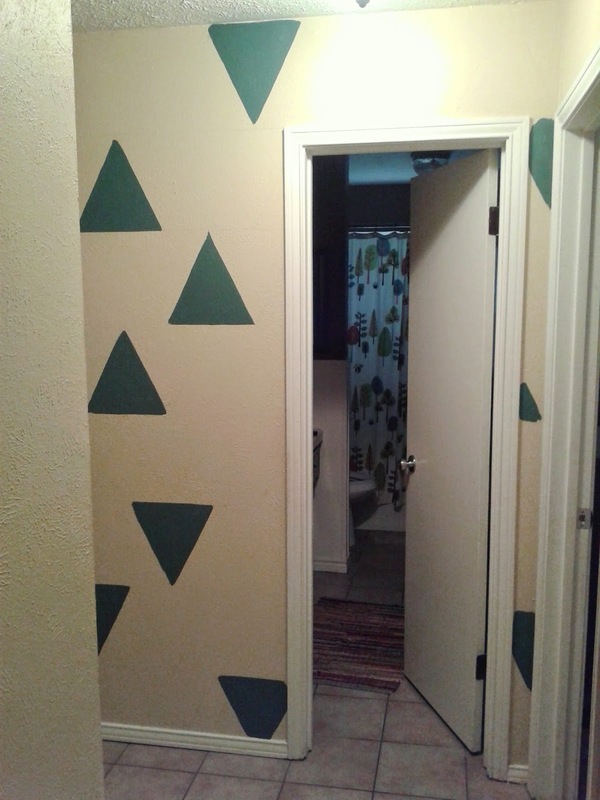 In any case, here's the plan: triangles, paint brushes, and the plain little nook around the corner of the long downstairs hallway. Using a level, the lines got penciled on, and then a makeshift triangle template cut from a pizza box created the rest. Leftover paint from other projects filled in the shapes. Often times you have make it about half way through a project before you can visualize how it's going to look completed. I H A T E D it. 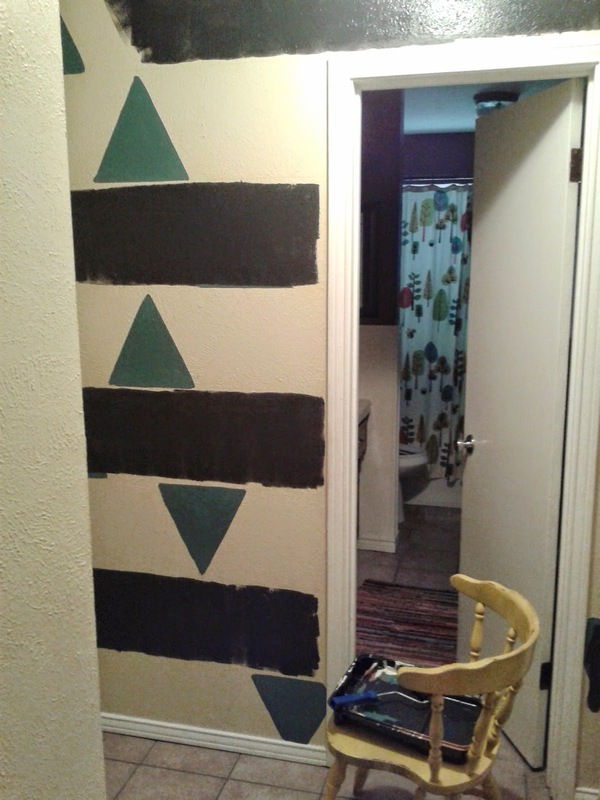 I cannot emphasize enough how much DIY projects are 75% trial and error. 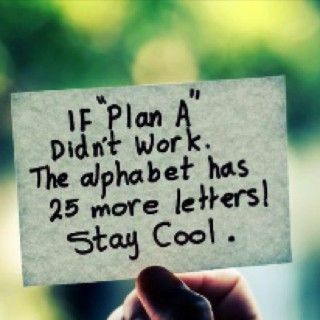 Try it, mess it up, do something else. Another reason to use what you've got - you're only out time, not money. 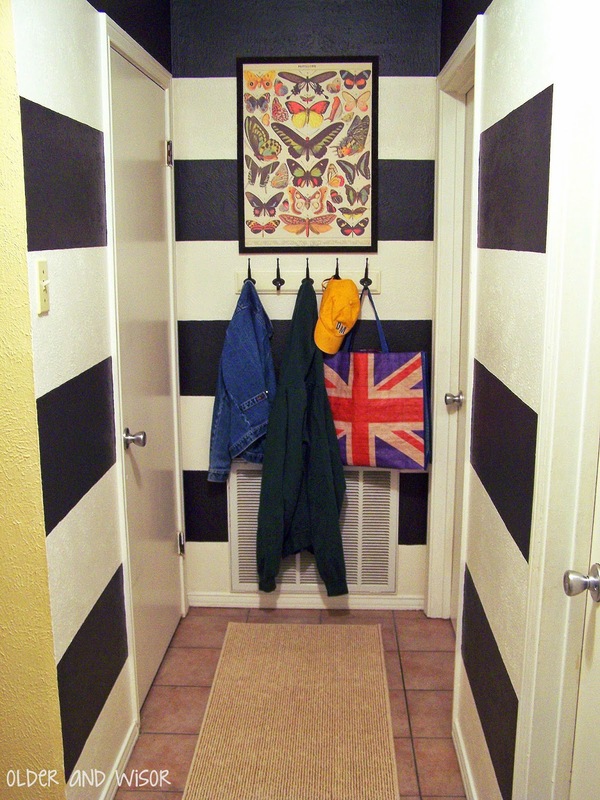 The stripes in the entry way were covered up long ago, so perhaps the universe was telling me that they needed to be resurrected here to cover up this disaster? 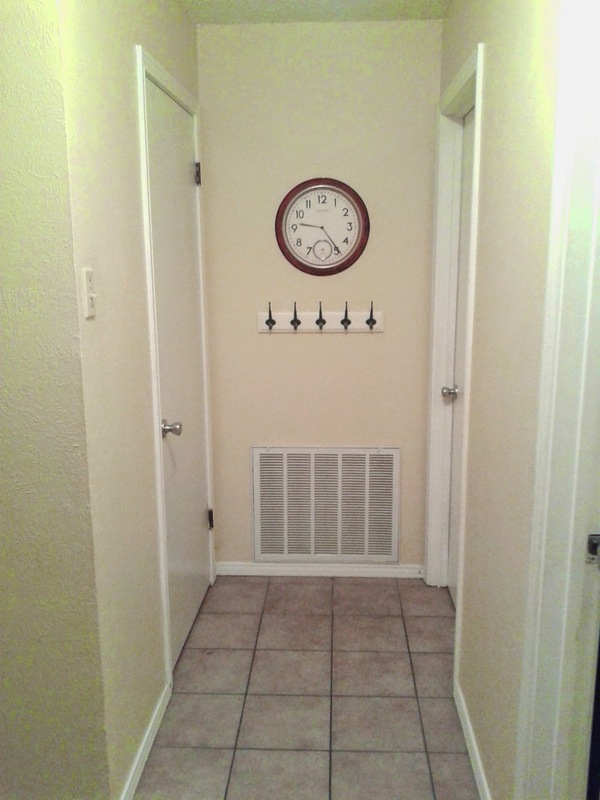 A piece of decorative paper makes for some less-than-$4-art (the clock had dropped a few too many times to keep time consistently), and the Ikea hooks were already there. It looks great! I like the stripes better than the triangles. The stripes look clean and fresh. ur good!!! this totally says come to the end of the hallway and see what gem is down here, LOVE that decorative paper! The main downstairs bathroom is off one of those doorways, so maybe it'll distract from Brendan on the toilet with the door always open? happy accident indeed :) I've read that horizontal stripes are a great strategy for making small and / or choppy spaces (lots of doors, windows, etc breaking up the wall) appear much larger and more cohesive since they draw your eye around the room, from starting point back to starting point. The area you painted does feel much larger after. 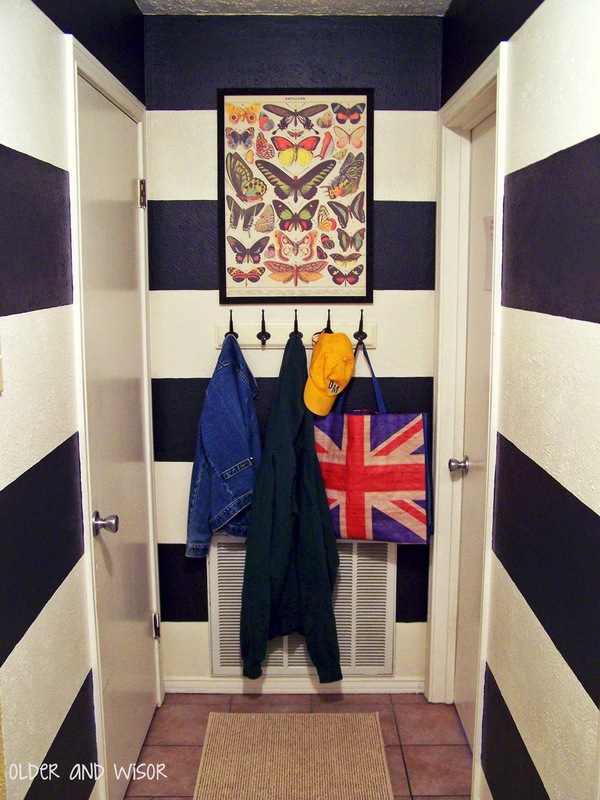 Love the butterfly "art" as a soft compliment to the bold stripes. Pretty sure the words "happy accident" come out my mouth on a daily basis! Your happy accident turned out great. Bold, graphic and yummy! My beloved Kristen - what a treat!! I miss your blog!!!! And yes, having that Paper Source open on Park and Preston is dangerous. Have you ventured in yet? Not as big as Northpark's, but certainly closer. Love how it turned out. The stripes are great. Sometimes I wish I were bold enough just to go ahead and do something like that. Who knows maybe one day I will. That looks awesome! And needless to say, I love your paper art. 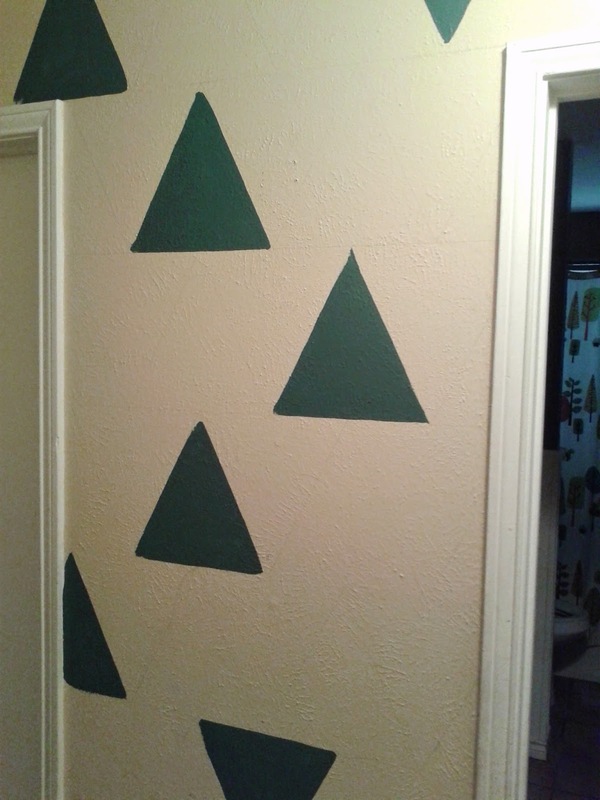 Did you freak just a little bit when you realised you hated the triangles...? Great recovery! Hahah yes...DIY projects are way, way too much trial and error. :P I love how it turned out in the end though! I love the stripes. Great colour contrast and yes, the hallway looks bigger. I'm such a sucker for contrast. And anything that detracts from dog hair on the floor. My best advice is to keep your storage containers/bins/organization visually interesting as well as functional...then you don't mind seeing them. P.S I'm totally jealous - I wish I could draw! Love the stripes! That's a nice idea!